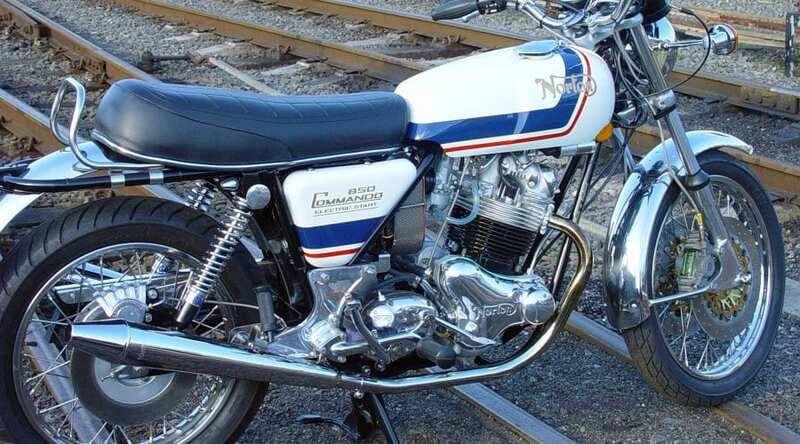 The story of how in 1972 Norton solved the problem with main bearings in the Combat-tuned engines of their Commandos by fitting the legendary ‘Superblend’ roller bearings is well-known. These bearings are sometimes described as having ‘barrel-shaped’ rollers. Bearings known as ‘Superblends’ can still be obtained today from many reputable suppliers and owners’ clubs. The problem for me is that there was only ever one ‘Superblend’ bearing, and it hasn’t been made for some time. I’ll explain. In 1972 Norton Villiers were facing a serious problem with their flagship Norton Commando with the new Combat-spec engine. Main bearing life had always been an issue on road-going Commandos; failures between 10 and 15,000 miles were not unknown. Increasing the compression ratio from 9:1 to 10.2:1, fitting a hotter, SS camshaft and using 32mm rather than 30mm bore carburettors combined to stress the engine and its main bearings further. In an effort to reduce failures, Norton had changed from a roller (drive side) and ball (timing side) bearing to paired rollers in late 1971 (see Service Release 68). With the more highly-tuned Combat engine, available from 1972, bearing failures were not unknown at around 4000 miles. These failures were known to dealers and Norton but rarely surfaced in the press. Low mileage road tests and racing relatively short distances between engine rebuilds did not expose the problem. 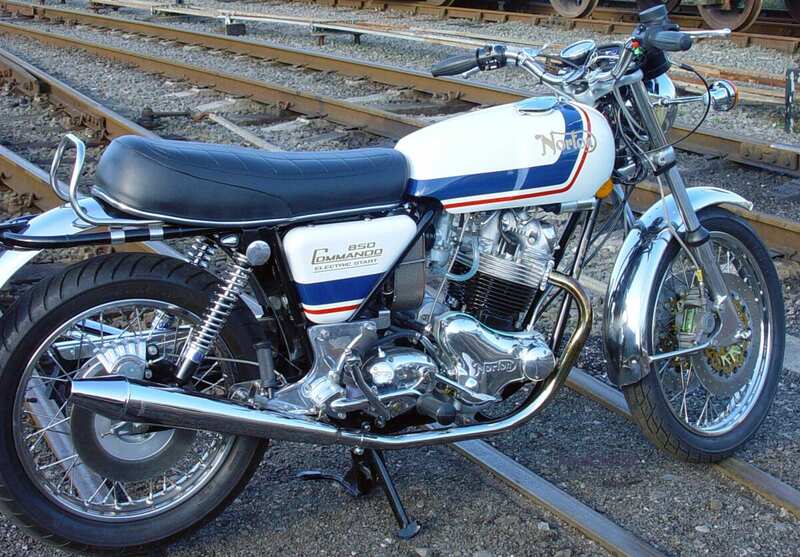 An exception was a 2000 mile continental road test by Bike magazine in 1972. 200 miles before the end of the trip the reviewer noticed the Interstate’s Combat engine ‘making sounds of pain and anguish’ and kept the revs below 3000 to limp home. Surprisingly not too much was made of this by Bike and the reason for the failure was described as ‘a mystery’. Norton fitted this 6/MRJA30 bearing from August 1972 under Service Release N2/9 which designated the bearing ‘Superblend’ part number 063906. Meanwhile, Combat-engined 750s in production were rebuilt with a lowered compression ratio. Many customer bikes also had this work completed, and had main bearings replaced, under warranty. 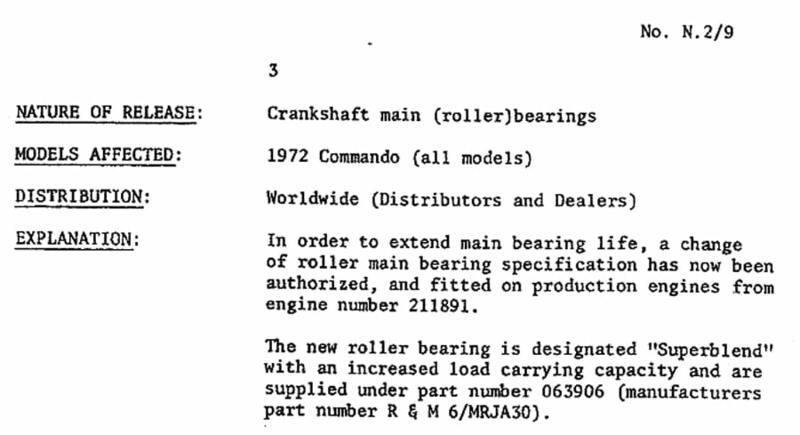 Less than 6 months after the service release which launched the Superblends came N2/10 in January 1973 which is the last known service release relating to main bearings. 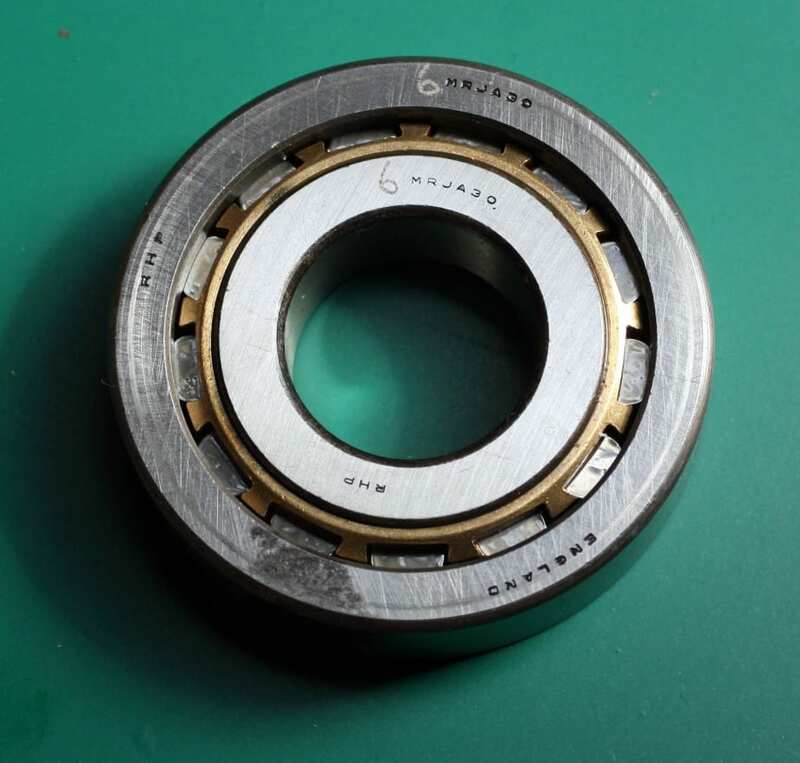 Although the specific bearing is not named it does have a new part number 064118 which is still used today. The term ‘Superblend’ does not appear in this service release. According to the Norton Owners’ Club Commando Service Notes written by Tim Stephens (Quality Engineer, Service Engineer Norton Villiers, Andover 1970-74) and John Hudson (Service Manager and Norton employee 1955-76) published in 1979, only two bearing types are recommended, part numbers 063906 from Ransome and Marles and 064118 from FAG of type NJ306E. The obvious conclusion is that the FAG bearing NJ306E superseded the R&M 6/MRJA30 in January 1973. 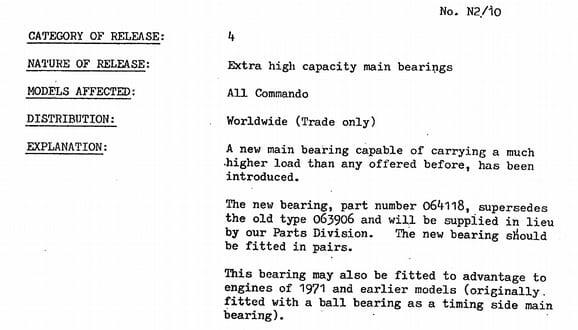 The 850 Commandos were then released, all fitted with FAG main bearings (according to the NOC Commando Service Notes). Norton brochures of 1973 and 1974 referred to the Superblend higher capacity main bearings but the name was dropped from the 1975 brochure. The lower state of tune of the 850 engine is noticeable. Norton did not want a repeat of the Combat problems. The main bearing débâcle then receded into the mists of time – as did Norton and the rest of the British motorcycle industry a few years later. But what became of the ‘Superblend’ name? Well it has persisted and become extended in use. This is almost entirely incorrect and must largely be for marketing purposes and to reassure customers who continue to accept the fitting of ‘Superblends’ as received wisdom. In my opinion the only valid use of the term ought to be reserved for the original bearings clearly marked 6 MRJA30 and with the manufacture marks of either R&M (Ransome & Marles) or RHP (Ransome, Hoffman & Pollard). Any such bearings are likely to be at least 40 years old. Next time: what was so special about Superblend bearings in the first place? With thanks to those who provided material and who helped in early reviews of some of the material included here; Jim Comstock (who’s work inspired this research), ‘Kommando’, ‘LAB’ and JM Leadbeater (Access Norton Forum), John Dunn (Norton Owners Club, Technical Support – Commandos), John Holmes and Les Howard (NOC members). Special thanks are due to Jim Comstock for his initiative in measuring bearing rollers, to JM Leadbeater for the foresight in taking measurements and recording specifications of an original R&M bearing and to Anthony Curzon for loaning the RHP 6/MRJA30 bearing. Thank you also to those who gave permission to use photographs. The provision of new information from Neil Wright (Product Engineer at INA FAG) is gratefully acknowledged as is the provision gratis by FAG of a hardback copy of their rolling bearing catalogue. Andy has written a more detailed fully referenced document which can be made available on request (email RCHQ and we’ll pass on your mail). The author has tried to verify the contents of this article and the reference document as far as is practicable but would be happy to modify these if any new verifiable evidence becomes available.